Lizzie is a fat girl. She thinks she's unattractive although friends tell her she's beautiful. 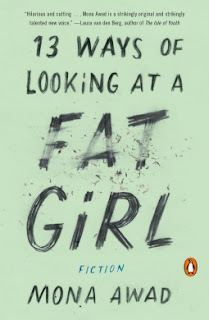 Lizzie, who also goes by the names Elizabeth and Beth as she grows up, tries and does change her weight, but through it all she believes she's a fat girl no matter what the scales and the mirror say. This collection of related short stories traces Lizzie from a teenager to adulthood. As a teenager, she's needy, trying to win approval by being everyone's friend and confident. Even into adulthood she remains insecure because she can't escape her fat girl image. The book paints a poignant portrait of someone with severe self-image problems. However, I found it difficult to like Lizzie or to get into the story. Perhaps this was due to the short story format. I found the first chapter where Lizzie, the teenager, follows her sexually-active friend's lead, interesting. The second chapter turned me off. It is told from the point of view of a drunken would-be song writer who is looking for someone to confide in late at night. He chooses Lizzie. The other stories continued in this pattern. I enjoyed some, but couldn't get into the others. I can't recommend this book as an enjoyable read. However, if you suffer from self-image problems, or know someone who does, it may be worth a look. I received this book from Penguin for this review.